For safe storage of our stars, size 40cm (16 inch) to 70cm (27 inch). 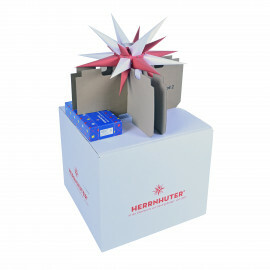 Just assemble the star once, and store it in the box after wintertime. Unfortunately there are no storage boxes for our stars i8 (80 cm / 32 inch) and A13 (130 cm / 51 inch) available. The storage box comes folded.